The Collagen Ampules contain a serum rich in collagen and elastin of marine origin, Ferulan, Cobiodefender EMR and natural clay to offer your skin a hydrated, plump, smooth and youthful appearance. With an almost instant skin penetration into the deeper layers of the skin, the serum is loaded with active ingredients to fight off environmental aggressors and moisture binding ingredients. Significantly diminish the visible signs of aging, improve skin firmness, lifting and defining the skin contour. Offers urban stress and anti-pollution protection. Boosts hydration, improves texture and tone. Also suitable to sensitive skin prone to irritation. 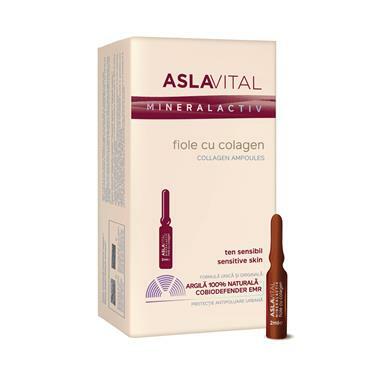 Collagen and Elastin of marine origin: Helps restore the dermis collagen and elastin, fades out wrinkles, maintains the cutaneous moisture and tonus, improve the flexibility and softness of the skin. Ferulan Complex (Rice Bran Oil and Ferulic Acid) - Scavenges free radicals and protects cells from environmental damage. In particular, it’s effective against two highly destructive free radicals, superoxide and hydroxyl radical. Reverses the effect of aging by slowing the formation of facial wrinkles. Usage: Apply daily, in the morning and/or evening, on a clean face, neck, décolletage and hands. Get the serum entirely at the bottom of the ampule. Make sure you hold the ampule standing before breaking it, to avoid spilling the product. Break the serum ampule using a tissue paper or textile towel. Read the instructions from the leaflet inside the packaging if use the protection cap to break the ampule.